Hall Research has rolled out an RGB to HDMI/DVI converter that supports both analog and digital audio. The new converter, SC-VHD-HDMI, converts video input to DVI output or takes video and audio inputs and coverts the signals to a single HDMI output. With the use of extended display identification data, the resolution of the output is then automatically adjusted to the native resolution of a connected EDID-compatible display. For setting up displays that don't support EDID, buttons to manually adjust the output resolution have been built into the side of the converter. Resolutions supported by the converter include input and output resolutions up to 1,920 x 1,200 (WUXGA) and 1080p. Features of the converter include X-axis flip, for use with rear projections system and teleprompters, and an onscreen menu that offers adjustments to brightness, contrast, color, size, position, phase and delay. The converter's ports include a VGA input, analog audio input, optical audio input, HDMI out, analog audio out, and optical audio out. RGB (YPbPr) inputs and DVI outputs will need adapters to function. Switching between audio sources can be done with the onscreen menu. 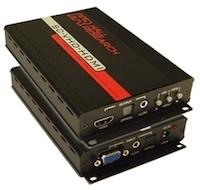 The SC-VHD-HDMI is currently available and retails for $385. Further information is available here.